Preheat oven to 350 degrees F. Line an 8 inch square baking pan with parchment paper, letting the sides overhang. In a heat-proof bowl placed over a saucepan of simmering water, melt the butter and white chocolate together, stirring until smooth. Remove from heat and add the sugar and salt. Whisk in the eggs one at a time, followed by the vanilla. Stir in the flour. 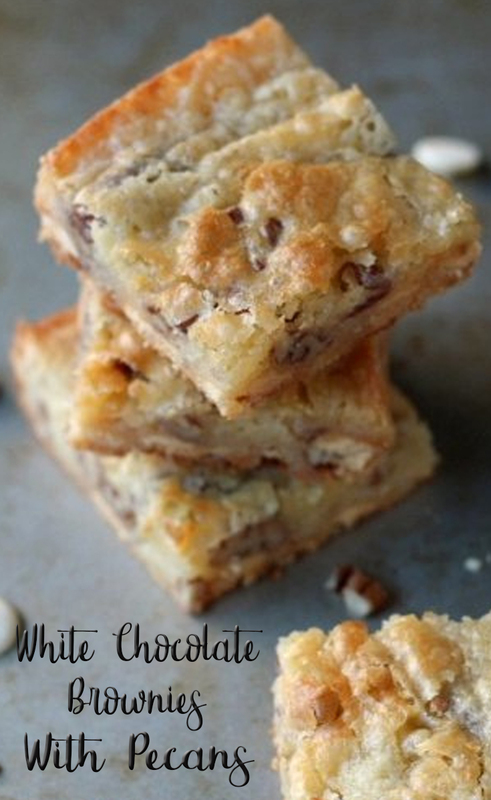 Add the white chocolate chips and pecans and stir until just combined. Pour batter into the prepared baking pan and bake until top just begins to turn golden brown, about 25-35 minutes. Let cool for 10 minutes in the pan, then lift the brownies out using the overhanging parchment paper and place on a wire rack to cool completely. Slice and store in an airtight container at room temperature for up to 5 days.